Matteo studied architecture at the University of Florence. He completed his architectural diploma and received his degree in 2006. Immediately after the graduation Matteo joined Zaha Hadid Architects in London holding various competitions and working on an important project such as City Life in Milan. After that he gains significant experiences in Italy, Dubai and UK. In 2007 Matteo won the 1st place for the project “Snake” for the design award “Progetti di Luce” sponsored by Philips. In 2008 his work has been published on the magazine Rizoma for the exhibition “Over/Underground Biennale of Young Italian Architect under 40 years”. The same year he has been selected in a list of best young Architects under 40 for the project “New Generation under 40 Porto/Pisa”. He found then his practice, MP2 a multidisciplinary office that focuses on interior design, from retail design to furniture and its spin-off I-GOT LAB an experimental laboratory of art. Recognized as a talented architect and designer Matteo has grown an excellent know‐how on the world of retail design of luxury rethinking the new image of Sebastian, Alberto Gozzi and many other brands worldwide. 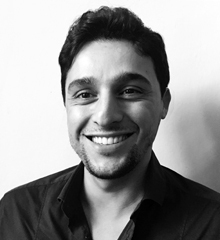 With more than 10 years of professional experience Matteo is involved in all aspects of the design process, from concept design through site construction aspects and project management. Ironic, visionary, inspired by imagination, his mission is to give a new meaning to every project.